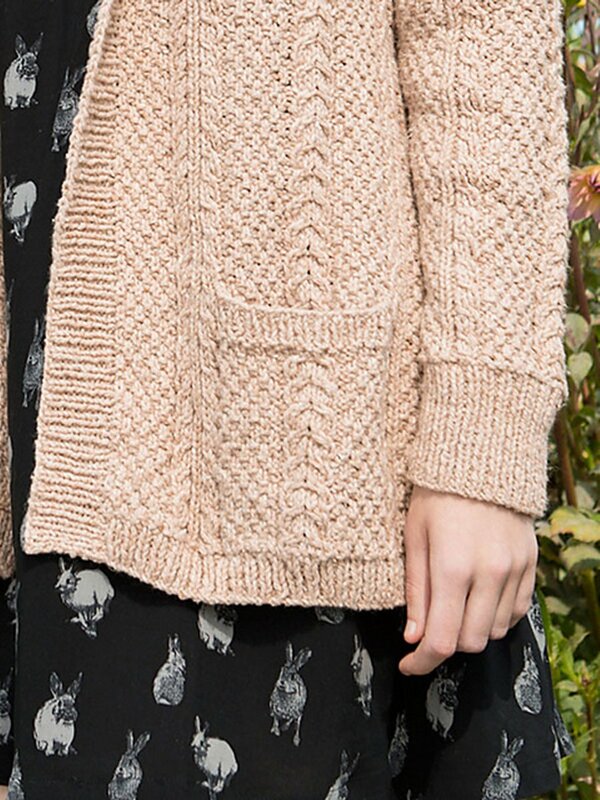 Astilbe is a classic, Aran-inspired cardigan with subtle, wear-every-day textures. Pattern is charted. Bust (closed) - 36(39-42-45-48-51-54)" Shown in size 36"
Note: This garment was designed with approximately 6 - 8" of ease. Please take this into consideration when selecting your size. Berroco Booklet 400 Mercado Patterns - Rosamond - PDF DOWNLOAD is a similar pattern: 22 (5.5 sts. / inch) finished gauge, adult cardigan garment, for women, and heavy worsted/aran (16-18 sts/4 in) yarn gauge. You may also like Berroco Portfolio Vol. 5 Patterns - Beachrock Cardigan - PDF DOWNLOAD, which is another similar pattern: adult cardigan garment, for women, heavy worsted/aran (16-18 sts/4 in) yarn gauge, and berroco remix suggested yarn. Hopefully our suggested yarn options for Zinnia - PDF DOWNLOAD can help you come up with your next exciting new project idea!